Brutal day in Palma - Thomas Zajac & Tanja Frank - Nacra 17 Sailingteam - 3 Apr 2014 from Valencia Sailing on Vimeo. I have put the 1940 The Rudder plans for the Lark scow into a separate post. Click here to view the Rudder Lark plans. Click here for the 1963 Bill Kerr instructions and plans to build a Lark. In the winter of 1897 - 1898, American C.G. 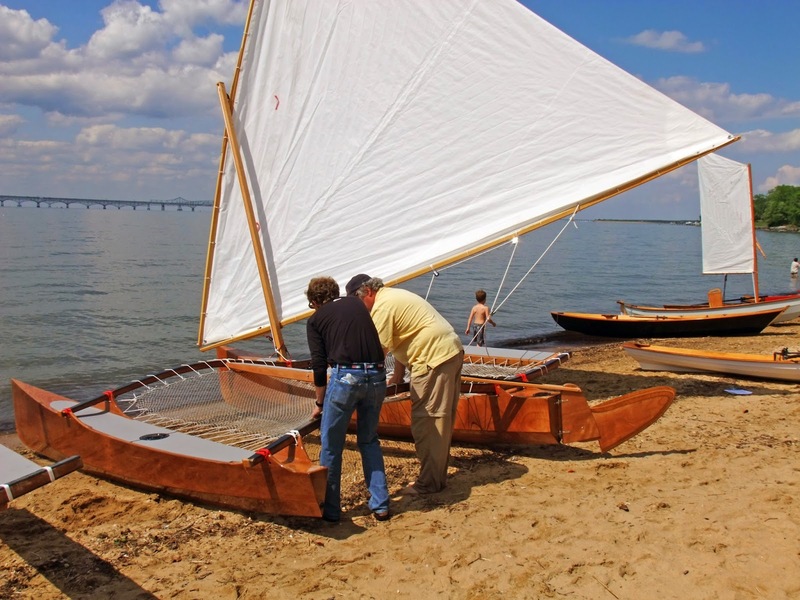 Davis designed and built a 16-foot chined scow for his own use. It was a simple build for that time, the hull copying the shallow arc bottom of the Clapham designed Bouncer (a designer Davis highly respected). 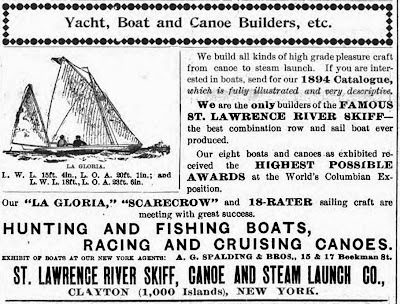 Davis claims he designed the Lark scow as a general daysailor but, in 1898, he raced his newly built scow in the fifteen-foot class in several Long Island regattas and won. Sensing a great deal of interest in his little scow, Davis, at the time the design editor of The Rudder, printed the plans over three issues in the fall of 1898. The response was enormous and readership in The Rudder exploded. 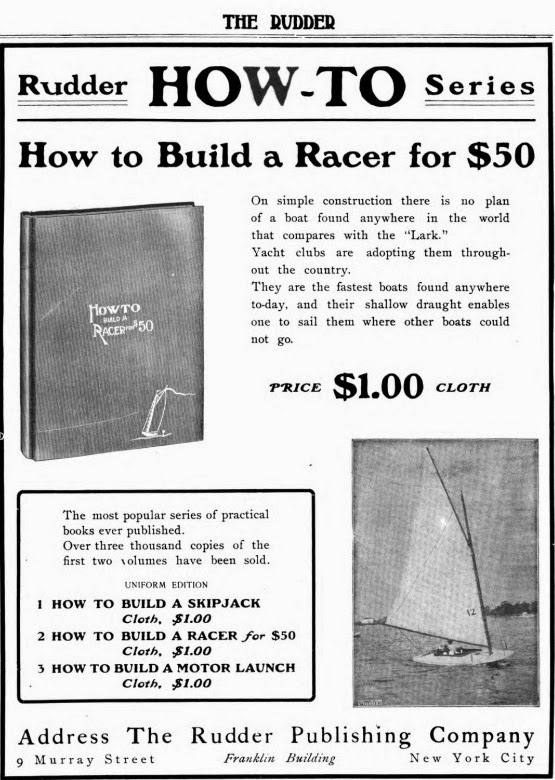 When you tap into a successful market, you keep going and The Rudder started a How-To series of cloth bound boat plans offering several different boats with the plans for the Lark advertised as "How to Build the Racer". 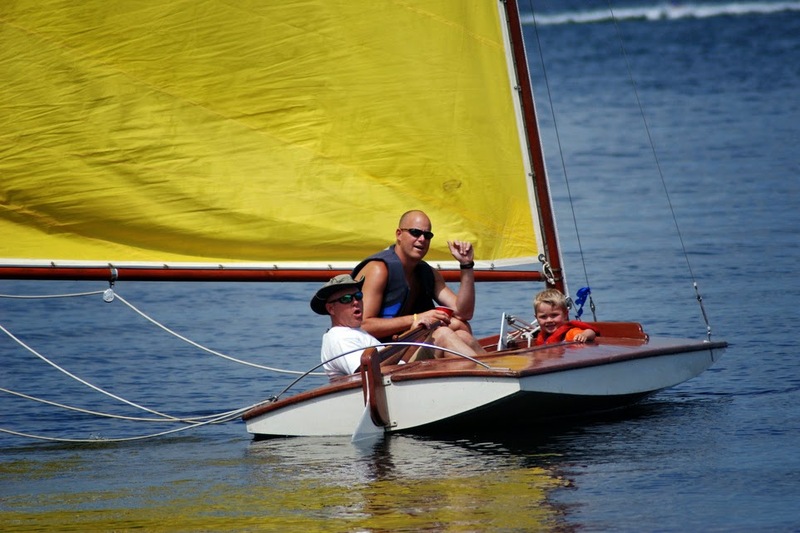 In the early 1900's the Lark scow was built everywhere, worldwide. Fifteen Larks were built at the Yokohama Y.C. Builders built to plans and those who couldn't help themselves built smaller Larks, bigger Larks, Larks with counter sterns. By the 1920's Lark fleets in the U.S. seemed to be concentrated around the Great Lakes. 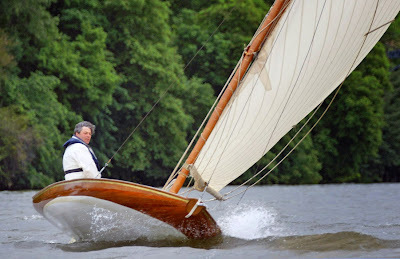 By the 1930's the Lark was disappearing as Crosby, a later editor at The Rudder, in 1931/32 introduced his own small sailboat design, the home-build V-shaped centerboarder, the 15- foot Snipe. The Rudder republished the plans for Lark in 1940 but by then, on the eve of World War II, the Lark was now in competition with several popular chined centerboarders available in the United States; the aforementioned Snipe, as well as the Comet, Moth, and Lightning classes. As far as I can determine, there is one Lark fleet remaining in the world (there are two Lark variants still going - I'll cover those further down this post). Rondeau Bay in Ontario, Canada (just across Lake Erie from Toledo, Ohio), specifically Erieau Y.C., has a fleet of about a dozen. The Lark fleet on Rondeau Bay got going in the 1930's. From a comment by Don Weir on the Rondeau Lark builders: "I am proud to say my grandfather Fred "Pop" Weir and my Uncle Al built the fleet of them in Rondeau. I first learned to sail in one of them." The Lark fleet at Erineau YC bucked the gradual extinction of the Lark by achieving its greatest popularity after World War II. In 1972 between 30-50 Larks were racing on Rondeau Bay. In 1963 Bill Kerr produced plans to build the Lark in plywood and the current fleet in Erieau Y.C has a combination of some new builds as well as restorations. They still retain the traditional wooden spars and have made the rig a gunter rig compared to the original gaff rig. Lark variants still going strong are the Larken Klasse of The Netherlands, specifically Friesland, and the Monotype de Chatou of France. The Larken Klasse is a smaller Lark, a 13-footer singlehander with keel, a design that came out at the beginning of the 1920's. 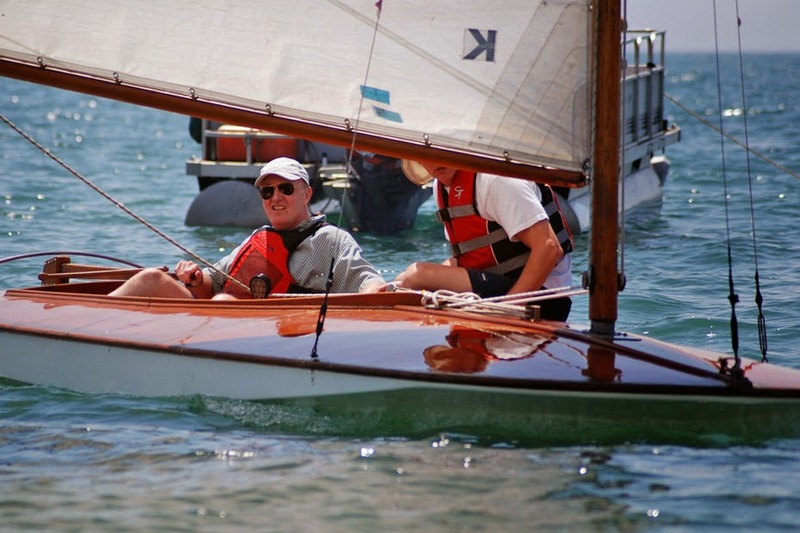 The Larken Klasse is the most popular of any Lark type today, the class experiencing a resurgence with upwards of 20+ attending regattas. The Larken Klasse sports a full battened, gunter rig that Manfred Curry popularized in the 1930's. The Monotype de Chatou was a French variant that combined the Lark with the Linton Hope Sorceress design and was built at the beginning of the early 1900's. It is hard to see a direct connection to the Lark when looking at photos of the Monotype de Chatou as it appears to be round-bilged like the Linton Hope Sorceress and not hard-chined as is the Lark. Those still sailing, as far as I can determine, are restorations. 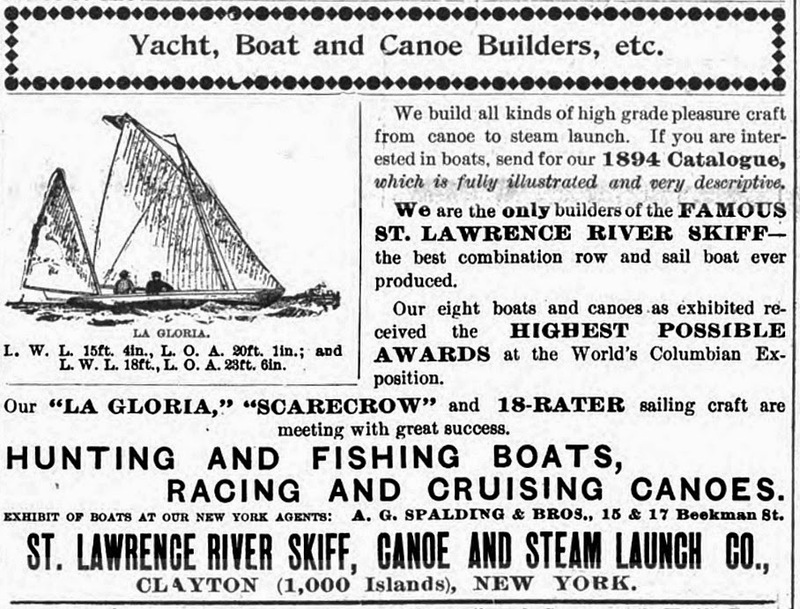 This ad comes from a 1901 issue of The Rudder. 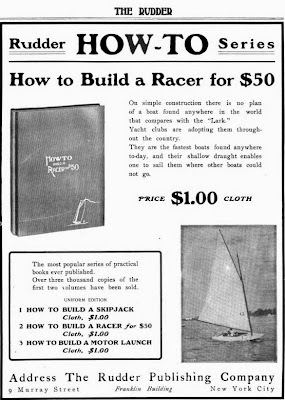 The plans for the Lark were so successful that The Rudder began a very popular How-To series at the turn of the century. They would also add another scow, the Mower designed 24 foot Swallow scow, the plans first published in the magazine and then a cloth bound How-To book. A photo of a the shorter Friesland;Larken Klasse stuffing her bow into a wave. A photo of the French Monotype de Chatou. The dimensions are the same as the Lark scow but the design is round bilged and doesn't have a scow bow. Photo by Pascale Guittonneau. 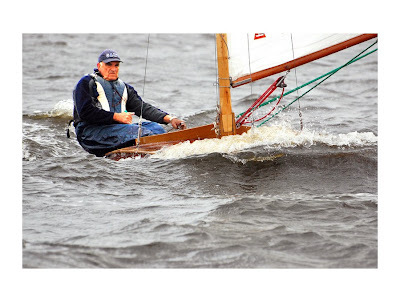 Click here for the Swallow scow, The Rudder magazines second DIY scow. Plans came out in 1899. Skûtsje are a version of the traditional Dutch working scows that are now raced for fun (though I think a large portion of the video below is discussing what happens to the fun part of a traditional class when the racing becomes very competitive - note the PT training in the video). These are big boats, upwards of 20 meters, but narrow to fit the canals. They are unballasted, with two leeboards, and they do capsize, with some regularity, when pushed too hard. Click here for the Wikipedia entry on the Skûtsje. Warning: The following video is for sailing geeks like me, who would watch an excellent 1/2 hour documentary in another language, just to marvel at the shots of these work boats racing under sail. I wonder if we will ever see a version with English sub-titles? "Even if you knew Dutch you would still miss more than half of the video. They speak Fries which is spoken in Friesland. My Grandmom came from there...The story is about the sometimes opposing issues related to traditional skutse sailing versus bringing the boats and crew to a much higher competitive plane. 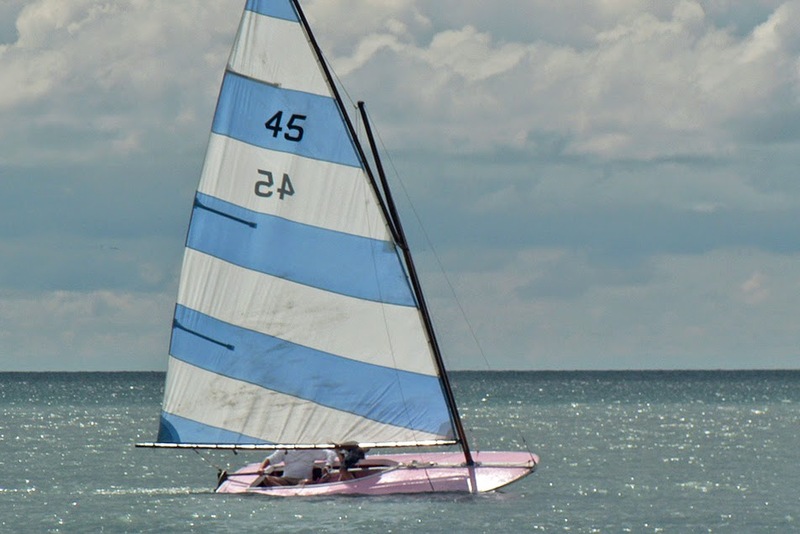 Some of us have read Dennis Connor's "No Excuse to Lose" but, then again, some of us still have a problem dotting the i's and crossing the t's when it comes to implementing Dennis's recipe to win sailboat races. Fricke Martschink, forging his own way to greatness, pauses to refuel during a break in the racing at the Classic Moth Midwinters. Video from Amy Linton. Classic Moth is a modified Skol. Back when I was a young dude I had no idea that sailing technology would create small keelboats that would plane like the high performance dinghies (Int 14's, 505's, Flying Dutchman, 470's) I grew up with. Well they have. And they do it singlehanded! Wowee! Photo taken on the docks at Brigantine Y.C. New Jersey. Blogger George A. ID's the three Classic Moth designs in a comment which I've dragged over to the main post. John Z., Bob Ames and I made a point to travel east to wander around the kayaks and small sailboats that abounded at Chesapeake Light Craft's OcoumeFest over on Kent Island this past May. 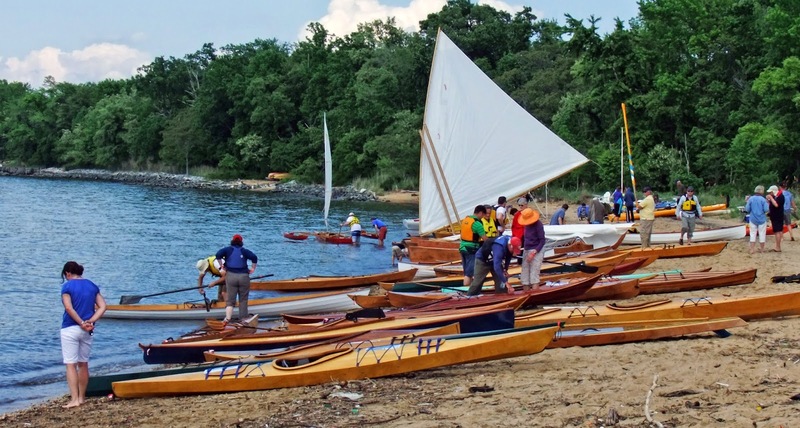 This is a CLC promotional event; for the most part, the small craft here are owner-built CLC kit boats. I did run into two interesting sailors who I proceeded to engage in long conversations. Dudley Dix, yacht designer, was there with his Paper Jet dinghy. Fortunately for me there was no wind so he was grounded on the beach. We talked at length about the catastrophic rudder failure and capsize on the aborted Capetown to Rio race in his design Black Cat - Click here to read this previous Earwigoagin post. He told a fascinating and harrowing story which reaffirms my desire to remain in dinghies close to shore and eschew any ocean racing. I also ran into Ben Fuller, a friend from back in the 1980's who was there to do the short 65 mile version of the Chesapeake Challenge in his kayak, which was to start Sunday on the morrow. As with any conversation with Ben we covered a lot of ground, from sailing 210's in Hawaii, to Delaware Hikers with racks, to his latest project of digitizing historical commercial fisherman and waterman photos. One of John Harris's designs that caught my eye was the two prototype 15' proas which he has named the Outrigger Junior. Designed for off-the-beach sailing, it looks like a reasonable kit-built alternative to the Hobie 16. Never having sailed a proa, I'm not sure what the experience is like but there has to be considerable difference from tack to tack; on one tack leveraging the weather ama with your weight and on the other tack, counting on the now-leeward ama to take all the sail loads. The sail plan is large and is of the crab-claw configuration (basically a lateen with a forward raked main-mast which keeps the boom well up in the air). John Z. was particularly interested in the netting used between the main hull and ama on the Junior. The wooden cross beams were reinforced with carbon fiber. A beach photo of OcoumeFest. I have been keeping up with Tillerman's excellent posts about his new love, the RS Aero singlehander. RS intends to build the Aero hull to a 30 kg. (66 lbs.) hull weight. This is a very, very ambitious target for a production dinghy. When I read of such super-lightweight numbers for the hull, especially for a dinghy designed for mass-market appeal, it reminds me of a cautionary tale from my days as a young blood, not quite 40 years ago. In the 1970's Ian Bruce followed up the Laser with the two man Tasar, a very early, ambitious attempt to reset dinghy technology. The Tasar, designed by Frank Bethwaite, was a larger version of the Northbridge Senior, a 14' two person hiking development class in Australia. The NS 14 was built at that time, in plywood to 100 lbs hull weight. Ian and Frank figured they could build the larger Tasar to 140 lbs. hull weight in foam/glass, a good 50 lbs. lighter than the Windmill class, which, here in the United States, we considered lightweight. The prototype Tasar, which I got to sail, was beautifully built in Montreal using Kevlar skins over foam core and polyester resin. Testing of the prototype showed no problems. However, when Performance Sailcraft switched the Tasar to the production phase, economics dictated that the Kevlar skins be jettisoned and very thin glass skins substituted to keep the hull weight at 140 lbs.. When the first production boats came out, it quickly became obvious that the thin glass skins had nowhere near the dent resistance of the prototype's Kevlar skins. Treating early production Tasars over the space of several months with, what we considered normal Laser-type usage in the seventies, (dollies were mostly non-existent) quarter size dents appeared over the bottom of the production Tasar hull, giving the hull an appearance of surviving a hailstorm. Occasionally a stray protruding nail head on a dock would actually puncture the outer skin. This fragility would doom the Tasar in North America. 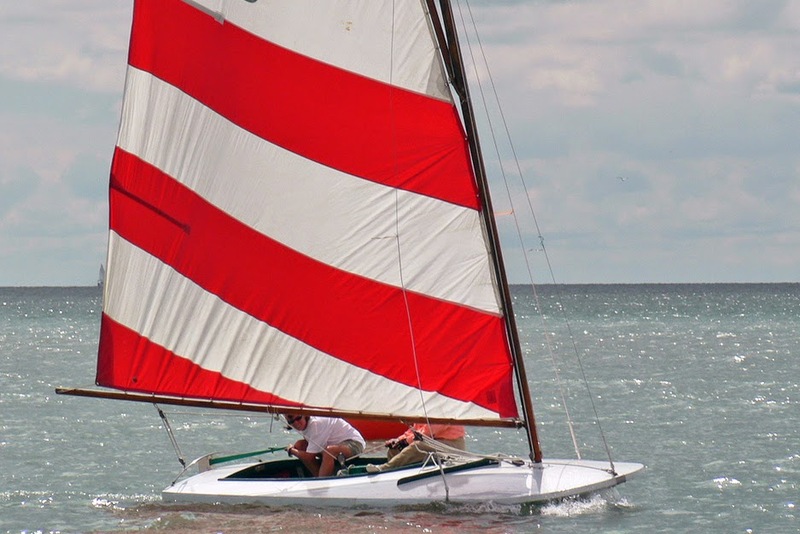 It would not be another best-seller for Performance Sailcraft. In his next attempt at the market, Ian Bruce stepped back and did a more Laser-like two-hander, the Laser II. Granted, in forty years, today's material technologies for building production dinghies have improved and RS is using all the modern wrinkles to create the Aero. Epoxy resin is better than polyester. There are better fabrics. Still, thin outer skins over foam construction are more damage prone. Two or three years ago I was on the lawn at West River Sailing Club at the end of a day of racing. 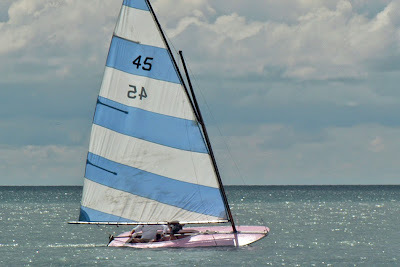 The A-Cat catamarans (which use similar thin skin construction to keep weight to a minimum - though they use carbon skins throughout) had been racing and I watched a fellow maneuver his A around the various boats strewn on the lawn to reach the water hose at the side of the club. In the process of turning, he smacked one of his hulls against the corner of the club house, leaving a nice dent about 6 inches from the transom. To an A-Cat skipper, this type of damage is part and parcel of owning a very lightweight, very high-performance sailboat. I'm not sure, given the intended market RS has envisioned for the Aero, that this constant danger of small contact becoming a visual blemish, lump, dent, or hollow on the hull is what an RS Aero skipper is buying into. It will be interesting to see how the introduction of the RS Aero plays out. And, I will be the first to admit, many times my predictions have been wrong. Click here for some previous Earwigoagin posts that have featured the Tasar. Click here for some previous Earwigoagin posts that have featured the RS Aero. There is one historical mistake in the video. Skip Etchells did his Connecticut design in the late 1940's, not the late 1950's.